Some lessons seem hard to learn — or at least, we require several tries to learn them. We make some of the same mistakes repeatedly, or we invent whole catalogs of mistake variations. You can tell when you've met one of these situations, because you have a clear sense of whoops-been-here-before. Oscar Wisting, a member of Roald Amundsen's party, and his dog team in triumph at the South Pole in 1911. Hauling equipment in dog sleds was controversial at the time in the world of European polar exploration, even though Arctic peoples had been working with dogs in this way for millennia. In 1903-1905, Amundsen had led the first successful traverse of the Northwest Passage. 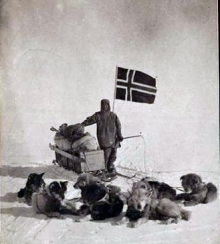 It was during this expedition that Amundsen learned from the Netslik Inuit how to let go of the European beliefs about dogs, their limitations, and the rightness of working them in this way. Letting go of cherished beliefs is usually easier with help from those who have either never held those beliefs, or from those who have already made the leap. The latter is probably somewhat easier, because we identify more readily with those who have made the same journey of belief that we are undertaking. The photo is from Amundsen's account of his journey to the South Pole, The South Pole , (now available from Cooper Square Press, but originally published in 1913 by J. Murray). It also appears in Amundsen's autobiographical work, My Life as an Explorer (Doubleday, Page & Company, New York: 1927). The photo is part of the collection of the National Library of Australia. Some of these hard lessons relate to coping with disappointments. Here are some examples. Almost nothing goes the way it's supposed to go the first time. And usually not the second time, either. When the available data conflicts with cherished beliefs, reconsidering those beliefs usually works better than clinging to them for dear life. When the available data conflicts with other people's cherished beliefs, they sometimes reject that data, or adopt with very weak evidence (or none) new postulates to explain why the data doesn't really conflict with their beliefs. You can't control what they do. Re-examine cherished beliefs periodically, even when there's no conflicting data. When the available data conflicts with how you wish things were, try changing your wishes. When what you desire absolutely requires sacrifices you're unprepared to make, you have to either change your desires or make those sacrifices. When what you want for other people conflicts with what they want for themselves, it's wise (though usually difficult) to remember that they're in charge of their lives. When what you want to say to someone will probably have explosive or hurtful results, it's usually (but not always) best to let it remain unsaid until you can find a gentler, safer way. If you can't find a gentler, safer way, you might have to take a chance, but one option is always silence. When you're the lone dissenter in a group you're working with, and they no longer want to hear from you, that's their choice to make. Respect it. When you no longer want to hear about something from someone who insists on making you listen, you must either accept that you will hear it again, or find a way to make him or her stop, or use the wondrous tool called "removal to a distance." Very little of what you've achieved was accomplished unaided. Credit for your achievements is much more valuable when shared. When your sense of fairness and right conflicts with what somebody more powerful wants, either make an accommodation, or move on, or become more powerful. Or some combination thereof. Would you like to see your comments posted here? rbrenHRXJmSjCdGHUnUHCner@ChacqTHXBOShhCBfmputoCanyon.comSend me your comments by email, or by Web form. I offer email and telephone coaching at both corporate and individual rates. Contact Rick for details at rbrenrDfyGKoUWUteLzPbner@ChacQqvThFysDOpYxWYKoCanyon.com or (650) 787-6475, or toll-free in the continental US at (866) 378-5470.